If you live in a region that experiences four seasons, environmental conditions can cause building materials to break down over time, leading to the need for replacement or costly repairs. Some of the most vulnerable areas to protect are your driveway, walkways, and patios, which are constantly exposed to the sun’s UV rays and to the elements. In fact, if you live in a four-season region, such as Middle Tn Nashville, it is imperative that you utilize some sort of driveway sealer to protect the longevity and value of your home. You can choose between driveway sealers that protect asphalt , concrete, or natural stone. Not only will they extend the life of your hard surfaces by protecting it from the elements, but driveway sealers protect it from water seepage, wear and tear, and staining as well. Not only will the protect your front walk and driveway, guaranteeing lasting beauty for your home’s exterior, but they can also be used to increase the useful life of home playgrounds, patios, and basketball courts. Over time, harmful UV rays from the sun can break down the binders in your patio or driveway materials, causing the structure to weaken. The weakened structure then becomes more vulnerable to damage from everyday wear and tear, and will not stand up as well to other environmental stresses such as water, snow, and ice. Water and ice can also lead to the crumbling of driveway materials. Cracks can form in the surface, allowing water seepage to undermine the strength of your driveway or patio. Driveway sealers help the surface hold up to water, ice, salt, snow, and the sun. Driveway sealers should be applied every two to three years in order to fully protect your driveway and maintain its beauty. You can purchase a quality driveway sealer and apply it yourself, or hire a local expert here in Nashville who will take care to apply the protective sealer for you. For patios, walkways, and driveways in Nashville Sealed Quigleys Landscaping and Hardscapes Contact us. The cost will vary depending upon whether you hire a professional or do it yourself, and depending upon the quality of driveway sealer you choose to use. Prices begin around $5 for a bucket of sealer that will cover approximately 400 square feet. For the best protection, driveway sealers that cover roughly the same area will cost around $20 to $25. For professional application, contact a driveway sealer specialist in your area. Overall, the relatively small cost and added benefits of applying driveway sealers are well worth the investment, especially when compared to the cost of repairing or resurfacing your driveway or natural stone. Not only do they increase your driveway’s longevity, but the added esthetic enhancement will help keep your home’s value at its peak. Your driveway is one of the first things people will notice about your home, and its condition can either add greatly or detract significantly from your home’s overall attractiveness. Do not take the chance of allowing your driveway to break down due to environmental stresses. Instead, protect it with one of the many quality driveway sealers available to you. 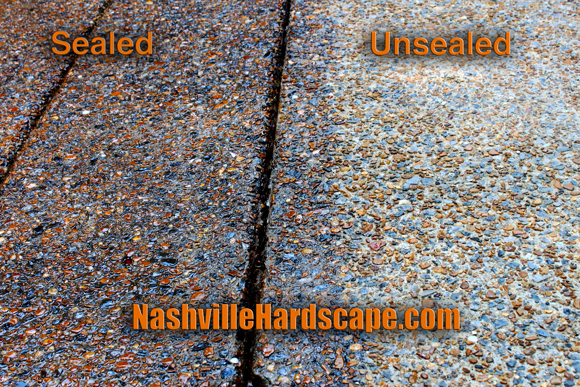 We are Patio and Driveway Sealers in the Nashville Tn area. We provide Hardscape sealing services to the Nashville Metro area and surrounding counties. We service Green Hills Tennessee, Tennessee, Murfreesboro, Smyrna, Brentwood, Franklin, Hermitage, Leipers Fork, Thompsons Station, Belle Meade, Green Hills, Kingston Springs, Brent Meade, Oak Hills, Almaville, Fairview, Forest Hills, Nolansville, Mount Juliet, and these counties: Williamson County, Davidson County, Maurey County, Rutherford County, Wilson County, Dickson County, Hickman County, and Marshall County Tennessee. West Nashville, East Nashville, North Nashville, South Nashville, North, South, East, West, Nashville area, Hardscaper, nashville Hardscaping, backyard hardscapes.